Dr Chachlani, having finished his medical school in 1986 and Doctor of Medicine degree in Pathology from India, completed his cellular pathology training in the United States from University of Illinois at Chicago and followed it with a specialist fellowship in Haematopathology. He holds certifications from the American Board of Pathology (Anatomic and Clinical Pathology); European Board of Pathology and is Fellow of the International Academy of Cytopathology. He also has certification in Medical Informatics from University of Sheffield, UK. 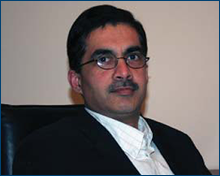 Dr Chachlani's main interests are in the fields of haematopathology, cytopathology, breast and gynaecologic pathology. Web design provided by IT Shared Service.